In times like these, sports can help countries and communities express a joyous defiance in the face of tragedy and terror. As the 21st men’s World Cup kicks off in Russia 30 years later, those memories are as clear as ever. I've lived most of my life in the United States, and normally I'd be rooting for both the U.S. and Mexico — regional rivals — to do well. Asking me to pick one over the other is an impossible task, although the fact that the U.S. men didn’t qualify this year has made my life a little easier. I grew up in Ohio, fully embracing everything it meant to be American, even dutifully answering to an English name, not my own. But in 2018, being Latino in America means being constantly reminded of how the current administration views Latinos as an alien “other.” To listen to our president talk, our very existence threatens the "real" America, in ways both explicit and implicit. The president leverages the specter of gang violence as an existential threat, despite crime nearing all-time lows. Immigrant children are being warehoused in makeshift camps; torn from their parents by border agents, as their families commit the crime of seeking a better life. On the other hand, rooting for Mexico — and other Latin American teams like Panama or Peru or Colombia — is a deeply American act. This is true for several reasons, most obviously because the United States is a nation of immigrants. But from a purely statistic standpoint, Mexico’s team is already incredibly popular in the U.S., as is Mexico's Liga MX. The numbers speak a plain truth. More than two million people tuned in to watch this spring's Liga MX final between Toluca and Santos; around 1.8 million watched Mexico play Wales in a friendly on May 28. Only the Champions' League final between Liverpool and Real Madrid drew a bigger television audience. El Tri also routinely plays friendly games in the United States — in front of very friendly crowds. Indeed, often these matches take places in football stadiums to accommodate the massive turnout. This past March, Mexico played Croatia before almost 80,000 fans in the Dallas Cowboys' stadium; a few days later, the team drew nearly 70,000 fans for a match against Iceland at the San Francisco 49ers' home field in California. 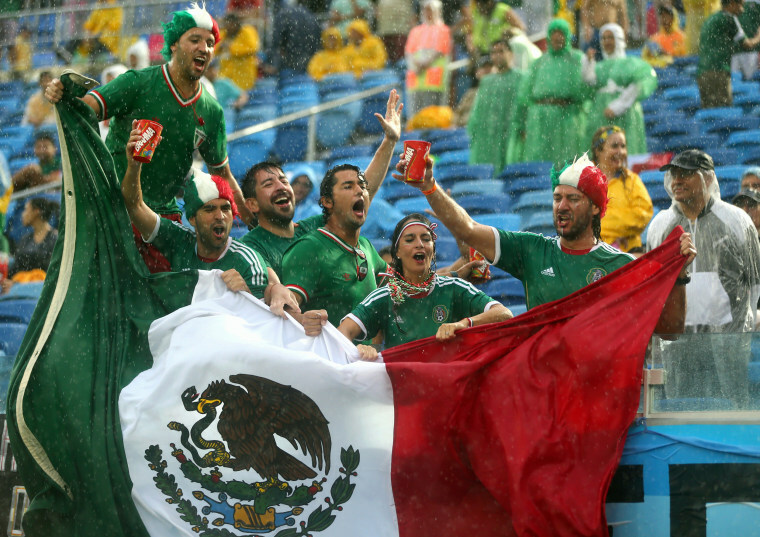 Doing this makes sense for the Mexican soccer federation — Pew estimates that there are around 36 million people of Mexican origin in the United States. If you include all Latinos, the number balloons to 58 million. In 2016, we composed 18 percent of the American population, and were the second-largest racial or ethnic group behind white people. The support for Mexico is so strong in the U.S. that the American national men’s team prefers to play Mexico in a place like my old hometown of Columbus, Ohio — Ohio is one of the few places where the U.S. men can enjoy some semblance of home-field advantage. For Mexico, a stadium like the Rose Bowl in Pasadena, California — as hallowed an American football stadium as you'll find — is practically a second home. They've beaten the United States in every game played there since 1994. The imprecations tossed against Latinos like me take on an air of desperation. America is changing, just as it always does. In this context, the imprecations tossed against Latinos like me take on an air of desperation. America is changing, just as it always does. President Donald Trump, and the people who support him, fear that change, and that fear buttresses their hate. But there's nothing to fear. America cannot help but change; that's its genius. The greatness of this country can’t be found in some mythic past but rather in the people — people like me — who live here now. I wear the green and white of Mexico's national team proudly while cheering for them on the soccer field, but I’ve also fought, just as proudly, under the red, white and blue flag of America’s army. Rafael Noboa y Rivera is a freelance writer living in New York City. His work has been published in the Guardian, the Washington Post, Deadspin, SBNation and elsewhere. Rafael Noboa y Rivera is a free-lance writer living in New York City. His work has been published in the Guardian, the Washington Post, Deadspin, SBNation, and elsewhere.